Nexcess provides web hosting solutions from shared hosting and virtual private servers to dedicated servers, server clusters and equipment co-location. We own and operate our Dearborn, MI based Data Center and serve clients worldwide. Our knowledgeable staff is available on-site 24/7. Heavy traffic to a website can result in performance problems, slower page speed, and fewer conversions. Note the screenshot below from Macy’s. 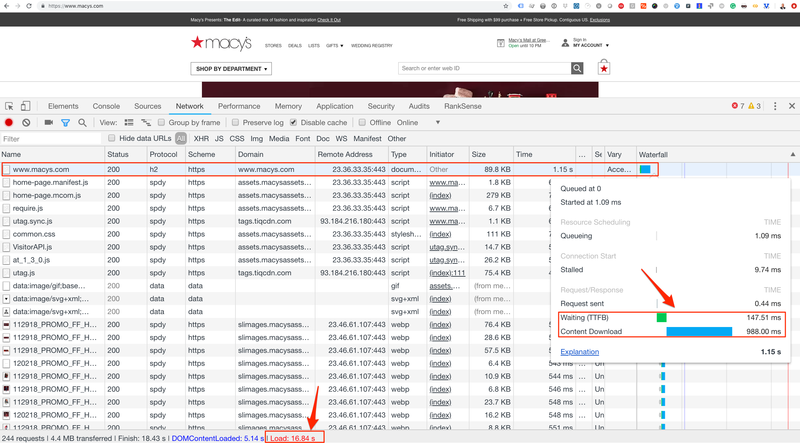 It shows the effect of Macys.com not caching the HTML of the home page in its content delivery network. This adds one second of page load time. Every other page resource will load after the HTML content is downloaded and parsed. The page took 16.84 seconds to load, which is slow. Macys.com is not caching its home page, leading to an extra second of load time. Click image to enlarge. 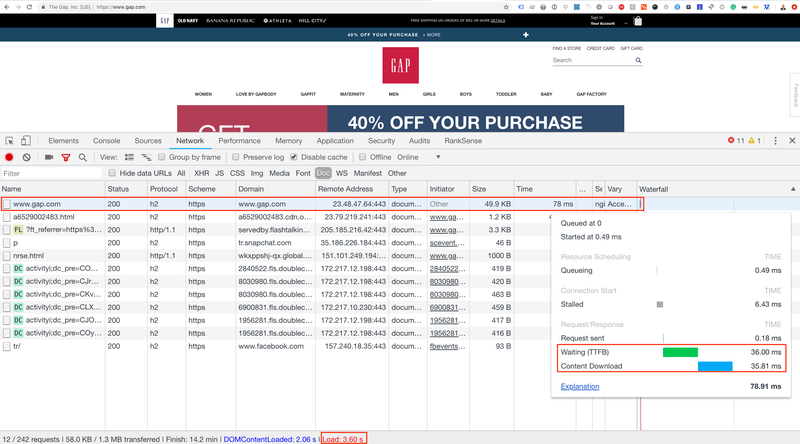 The Gap launched a new website that caches HTML content in its CDN. 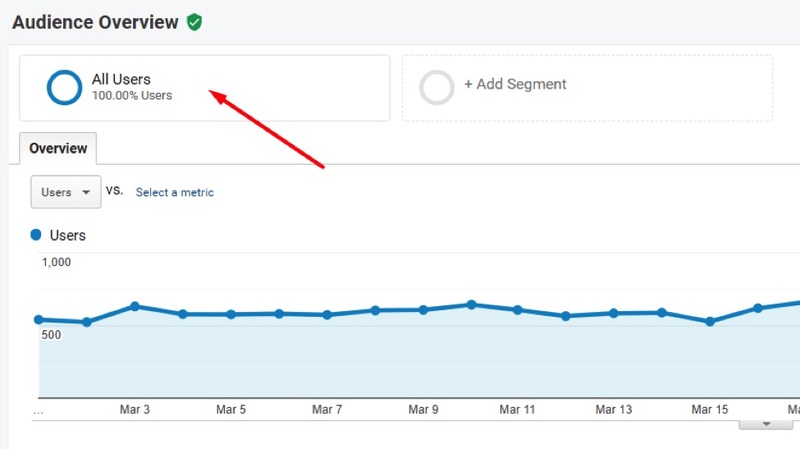 The HTML request now adds just 78.91 milliseconds — the home page loads in 3.60 seconds, which is much better than the 15 to 20 seconds it took in March. The Gap is caching HTML content, leading to faster page loads. Click image to enlarge. Caching HTML content on ecommerce websites — and dynamic websites in general — is tricky. It doesn’t happen by default in a CDN. 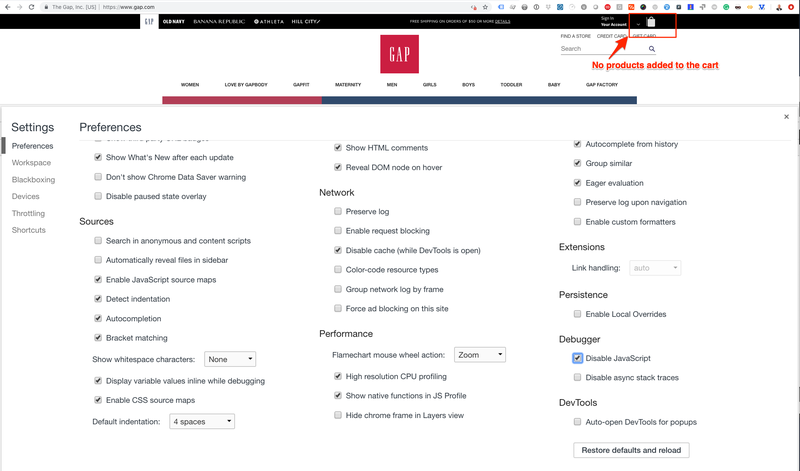 Most normally cache just static page resources such as images, style sheets, and scripts. For sites with static page content — i.e., not personalized in any way — page caching creates no problems. But for sites with dynamic content that changes among users, caching HTML content could create errors. For example, a visitor that adds products to his shopping cart changes the content on all pages to show the number of items in the cart. If an ecommerce merchant cached the pages of this user, other users would see an inaccurate number of items in their cart. This concept applies to any type of personalization. There are at least two solutions to the problem. Cache HTML only for anonymous users — users that are not logged in or haven’t added any products to their cart. 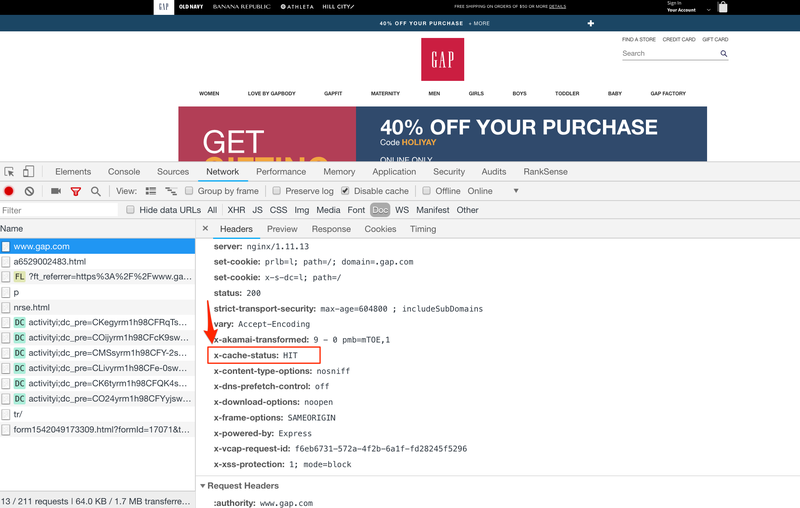 The Gap uses scripts for user personalization so it can still cache the page’s HTML. Click image to enlarge. Implementing user personalization in scripts allows caching of the page’s HTML. Then the scripts can modify the page after loading asynchronously. 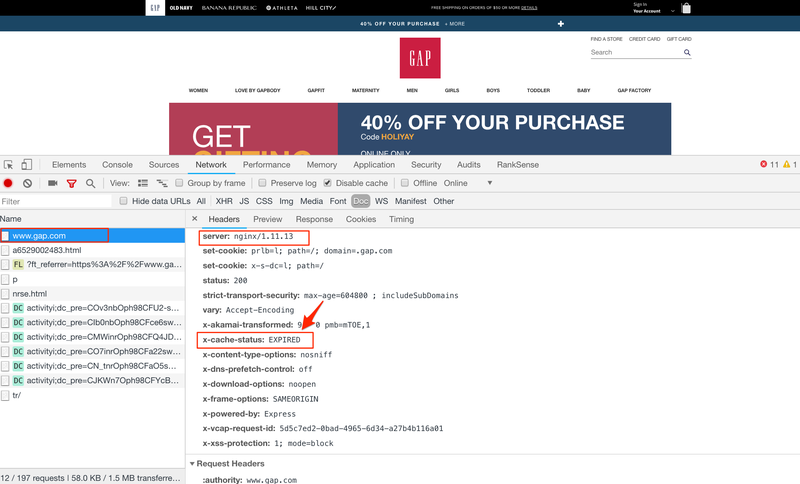 We can tell Gap.com is caching HTML by looking at the documentation for EXPIRED from Nginx, the web server. Click image to enlarge. After refreshing the page, the x-cache-status changed to HIT. Click image to enlarge. The Gap launched a new website that utilized the latest technologies. If, however, you need to cache HTML on an existing ecommerce platform, the anonymous user option might work better. This technique is known as “punching a hole” in the cache. It works in the following way. The web server or CDN will cache every page but avoids caching any request that meets exclusion criteria. The most common is a session cookie that the application sets when users log in or add items to the cart. The cookie is necessary to track each user individually. Here are some sample session cookies for popular ecommerce and content platforms. Again, these are cookies for users that have personalized content — such as those that log in or add items to their carts. Excluding their pages from the cache will not benefit them in terms of faster page speed. But they are likely a small percentage of total visitors. The rest will experience fast-loading pages. Assume your site’s web server is Nginx, and Magento 2 powers your store. Here is the configuration setting to enable caching for anonymous users. Enabling this on a web server or load balancer will increase performance. But the greatest benefit would come from implementing this on the CDN layer. 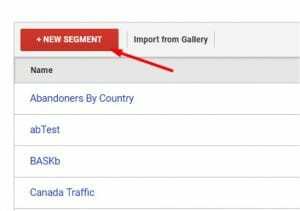 Here is how to do this for popular CDNs. Be sure to confirm with the CDN, however. Dynamic page caching with Akamai. Finally, for some sites it is not possible to find cookies to bypass. In those instances, we can explicitly cache key pages such as the home page, primary category pages, product listing pages, and product detail pages. A disadvantage of this approach is that the rules must be updated for new pages and categories. If you’re already a front-end developer, well, pretend you’re also wearing a pirate hat. 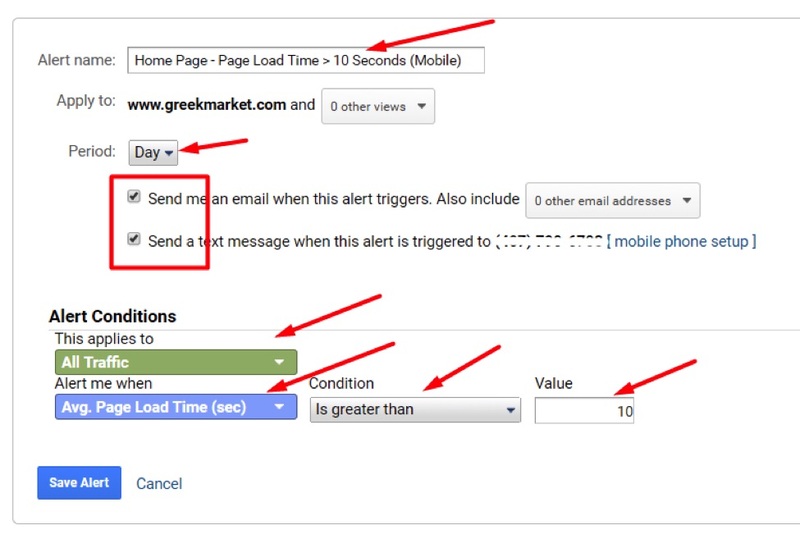 For this example, create an alert via email and text if the home page for mobile takes greater than 10 seconds to load, on average, on any day. Here are the steps. So, for this example, create an advanced segment to identify only the home page for the mobile version of my website. 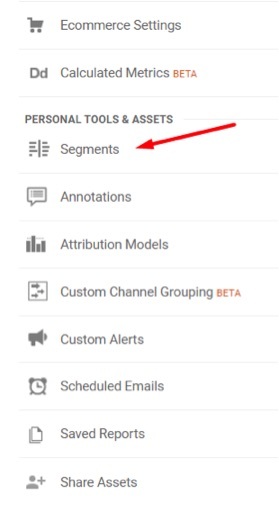 Save this Custom Alert for now — by selecting that this alert condition applies to “All Traffic” and to alert me when “Avg. 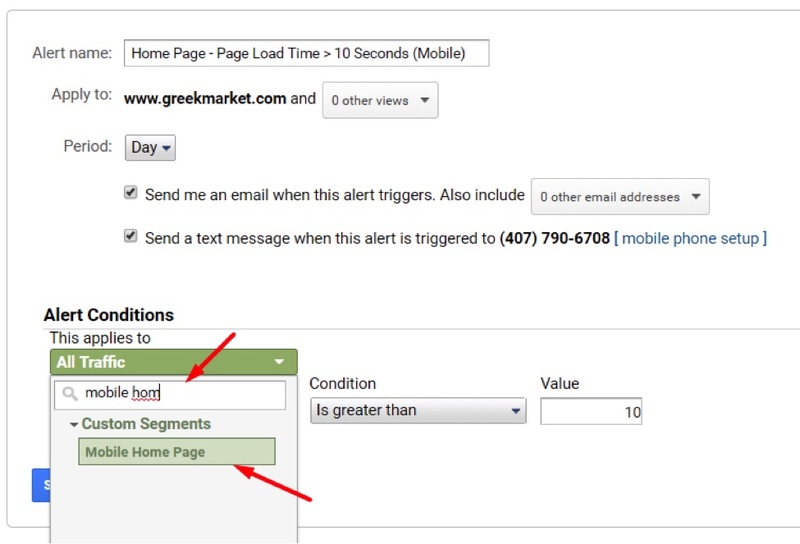 Page Load Time > 10 seconds” — and edit it after you create the advanced segment. Google generally sends alerts around noon following the trigger date. The following list of 20 websites is a great source for free stock assets. Internet connections are usually faster for desktops, which means web pages load quickly on home and office computers, especially for hardwired connections. Public Wi-Fi connections are on the rise, but so are the people who use them. And data carriers are still trying to figure out ways to serve those customers. Bigger screens allow for more defined details on navigation, search, and menus. Most menus are, by default, collapsed on smartphones, which means shoppers have to tap to see all the categories and filters. This makes it easy to miss key menu items. Larger screens also make for better zooming. 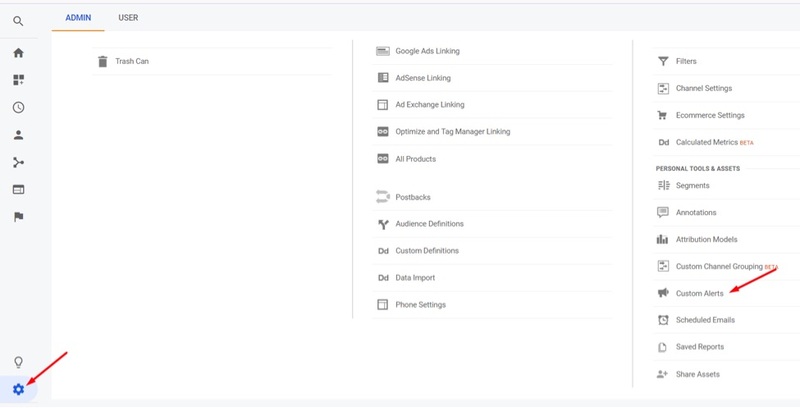 More products per page on categories and search results help convert. The maximum number of products per row on a smartphone is two, typically. On desktops, web pages can typically display 4 to 6 products horizontally. The ability to display several products on a single screen increases the chance of a sale; if shoppers don’t like the first two items, they may see something else that interests him. On smartphones, this requires scrolling. Desktop browsers have a more standardized way of fetching and delivering content. Smartphones manufacturers are trying to find the best ways to handle the content load. Some are better than others. For example, certain mobile devices require a cache dump for users to continue surfing their favorite websites or completing recurring tasks. This can be problematic if the user (i) doesn’t understand what’s wrong and (ii) doesn’t know how to clear the browser’s cache. Mobile devices run out of space more frequently. According to Remo Software, a producer of tools for mobile devices, 90 percent of smartphones have no more than 32 GB of storage. More than half of them run out of space due, mainly, to photos and videos. The “out of space” interruption can prevent ecommerce sales. Mobile device users have more distractions. Smartphones make it easier to find information on-the-go. But they have distractions in the form of notifications, tone alerts, and text and other messages, such as from Snapchat. While we cannot combat every issue that causes mobile shopping sessions to convert less, there are steps we can take to decrease the impact. Speed and performance. The best way to kill a potential sale is to serve up a slow site. Use proper tools to compress images, scripts, CSS, and HTML. No matter the platform, every web page must load multiple server requests — text, media, scripts, processes, and third-party tools, such as shipping calculators and personalization platforms. The more requests, the more time it takes to load the page. Don’t let page size alone fool you. A heavier web page with fewer requests can load faster than a smaller one with more requests. Optimize category and search results. Find ways to fit product thumbnails into two columns to minimize scrolling. Allow for cross-device shopping and persistent carts. This allows shoppers to pick up where they left off on the same or different device. Implement clear calls-to-action as well as user-verification actions. Confirming that a user has successfully added an item to the cart is as important as the add-to-cart button. Don’t leave a shopper guessing if the process worked. 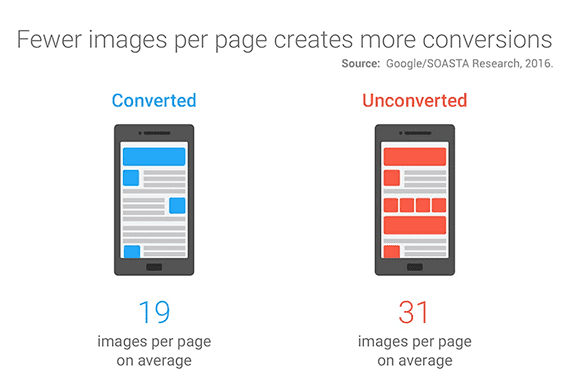 Images impact the load time of a website. The faster the site, the better the user experience, leading to conversions and profits. In 2019, a typical web page may request between 28 and 32 images when it loads, according to a report from the HTTP Archive. Those images may be necessary. For example, one would expect numerous images to appear on a product category page of an ecommerce website. These pictures are usually critical. Stock images that don’t communicate something. There is also data that indicates having fewer images on a web page leads to more sales. A report from 2016 indicates that relatively complex and slow pages (which often include lots of images) convert at a lower rate than faster pages with fewer images. When a typical web page loads, it requests every image listed in the page markup, even when many of those images are off screen and will only appear when or if the user swipes and scrolls down the page. Lazy loading of images is the process of loading an image only when it is needed. When a web page first loads, it requests only those images that will be immediately visible on the screen. Subsequent images load when the user moves down. The HTTP Archive reported that a mobile web page’s median kilobytes of image data transferred could drop from 843.5 KB to 426.7 KB when lazy loading off-screen images. This might reduce the initial page load time by 25 percent in some cases. A variation of lazy-loading images injects a low-resolution version of an image initially and then updates it with a high-quality version after a user can see it. This approach also significantly reduces how long it takes a page to load. In an article about shaving seconds from a site’s initial load time, contributor Hamlet Batista recommended Andrea Verlicchi’s LazyLoad script. Katie Hempenius, a software engineer at Google, recommends using Alexander Farkas’ Lazysizes script. Both of these solutions are examples of the many scripts for lazy loading. Raster formats — such as .jpg, .png, .webp, and .gif — make up many of the images on a typical web page. In some cases, these images can be compressed to make them load more quickly without a noticeable difference in quality. Compressed images can look nearly identical to much heavier uncompressed images. The image on the left is 169.5 KB. The image on the right is much smaller 39.5 KB but is similar in quality. Photo: Robert Bye. One can compress images manually using software such as Adobe Photoshop, ImageOptim, or Squoosh, to a name a few options. Or one could optimize automatically via a number of solutions, including content delivery networks, application programming interfaces, and scripts or packages. 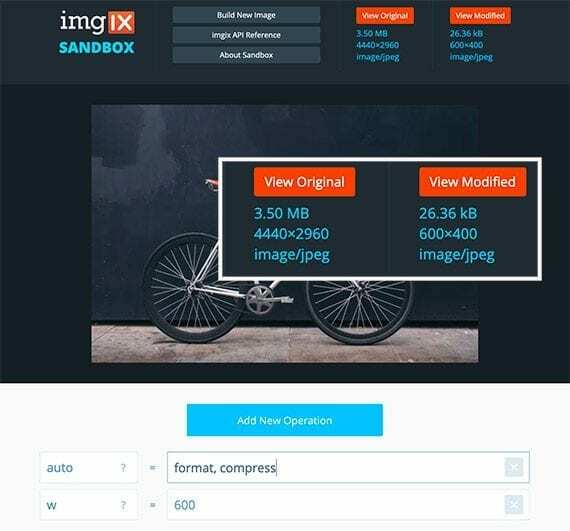 This example from Imgix, an image-optimization CDN, shows an original 3.5 MB photo reduced to 26.36 KB. In an article about image optimization, the Google Developers site recommended several solutions. Deliver the proper size image for a user’s screen. Wasted pixels add unnecessary weight. A 100 x 100 pixel uncompressed raster image is 40,000 bytes (10,000 x 4). To convert bytes to kilobytes, divide by 1,024. So 40,000 bytes works out to be about 39 KB. Imagine that you have an image that will be displayed on the screen at 360 x 200 pixels. At this size, the uncompressed raster image would be 72,000 pixels. Each of these pixels requires 4 bytes, for a total of 288,000 bytes or about 281 KB uncompressed. An oversized image at, say, 396 x 220 pixels would be much heavier. Specifically, the 396 x 220 image would occupy 87,120 pixels. That is 15,120 extra pixels (87,120 – 72,000). Those wasted pixels still require 4 bytes each for a total of 60,480 bytes or 59 KB. This example is for uncompressed raster images. And there are many ways to compress the image’s size in bytes without impacting its pixel resolution. Regardless, serve the proper size image whenever possible.